The New Mexico Department of Game and Fish is actively seeking the cooperation of private landowners willing to allow access to public hunters, anglers and trappers. This cooperation comes with a financial incentive and other benefits through the department’s Open Gate program. Monastery Lake, an Open Gate property in the Pecos River Canyon, is regularly stocked with trout and provides good handicap access. “Open Gate is a voluntary leasing program that provides private landowners with incentives to allow public access for hunting, fishing, and trapping,” said Ryan Darr, Open Gate coordinator. Darr said landowners may participate in two ways: allowing public access directly to a private parcel for hunting, fishing or trapping; or providing right-of-way access to public lands where exceptional fishing, trapping or hunting opportunities exist and access is limited. 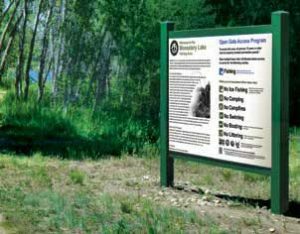 Participating private landowners receive multiple benefits, including monetary compensation, flexible lease agreements, liability protection, signs installed to manage access, and conservation officer patrols during open seasons. Payments are based on property location, acreage, type of wildlife habitat, and the hunting, fishing and/or trapping opportunities that will be permitted. The lease must support public hunting or fishing and provide access for the duration of the agreed season. The department is accepting applications for the Open Gate program. Qualifying land-owners are encouraged to apply early and all applications are subject to evaluation prior to leasing. Those with questions, or wanting to apply should contact Ryan Darr, Open Gate coordinator (right), at (888) 248-6866 or visit the department website at www.wildlife.state. nm.us.